Swim Step 1 is focused on getting your child comfortable with being in the water. It’s very important that your baby want to be there. If he/she doesn’t, you may choose to sit with them on the edge of the pool or a shallow step where they can play, or allow them to do so while staying within arm’s reach. Then, once they’ve warmed up to the idea, you can bring them into the water! The phrase about dipping your toes into something, couldn’t be more applicable to getting your baby acclimated to the water. The next step is to allow them to dip their toes in. Consider splashing a little water onto their stomach, too! Now, you can place your child in one of our comfortable and secure Baby Spring Floats (for ages 9-24 months). The Original Baby Spring Float is designed with a large circumference and an inner spring around the outside edge for stability. You and your baby will have a fun time as they experience the wonderful feeling of floating in the water for the first time! What makes a SwimWays Baby Spring Float different from other brands? Fabric-covered inflation and soft mesh seats keep babies comfortable in the water. Dual air chambers and safety valves enhance security. Large circumference and a patented inner spring around the outside edge of the float for added stability in the water. Folds flat into three compact circles for easy portability in the included carry case. Additional styles include baby floats with sun canopies, designs that allow parents and babies to float together, and baby floats with integrated toys. 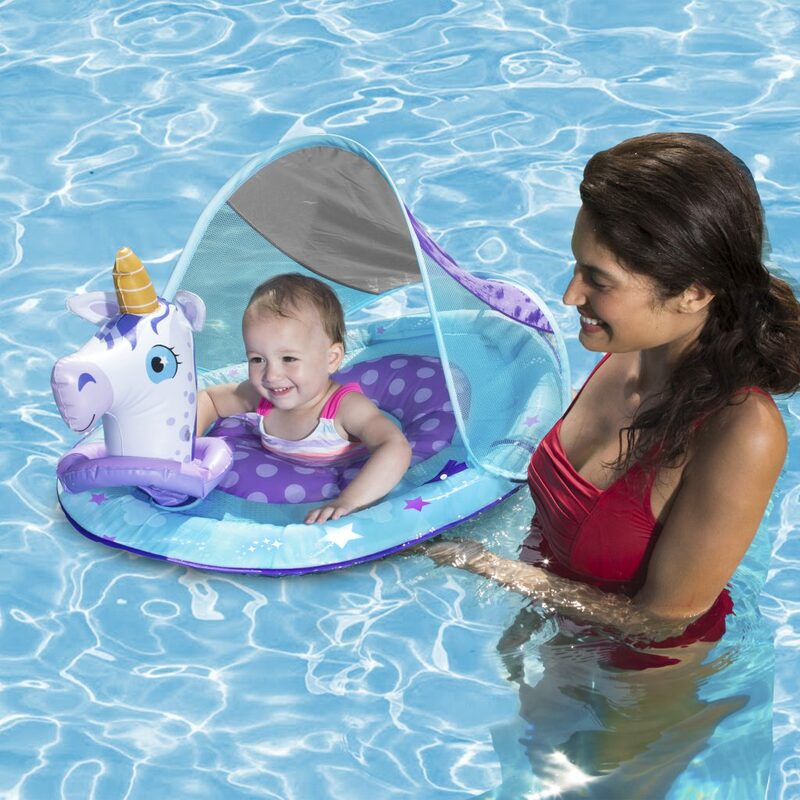 The SwimWays Infant Baby Spring Float with Sun Canopy is a fabric-covered baby float for infants. This float is for ages: 3 months – approximately 9 months (or until baby attempts to climb out or sit up). Here comes the fun part! You’ll want to begin encouraging your child to splash around, and maybe even splash you so that they will correlate FUN with being in the water. Be sure to take a look at the video on Swim Step 1 training. Note: Signing up for a Mommy and Me swim class is another great way to help get your child comfortable in the water. *Did you know that drowning is the leading cause of unintentional injury-related death for children ages 1-4? Help turn this tragedy around by teaching your kids to swim and practicing water safety with your family. Share this infographic online to help spread the word.